When I began this site way back in 2001, my travel experiences were rather limited, and my knowledge of European castles was limited primarily to the Heidelberg Castle not far from where I currently live. Given that, it was not hard to see why back when I posted it in May of that year, I gushed that it was "Majestic, Scenic, Breathtaking" and one of the finest castle complexes in the whole world, etc, etc. Since then, I found about a dozen castle and palace complexes that I believed were far more impressive than Heidelberg's, and one of the absolute best was the Schloss Wilhelmshöhe in Kassel's western suburb of Bad Wilhelmshöhe. Why was it better? To use my own words against me, I found it more magnificent, more scenic, and more breathtaking. Plus, it was restored better, covered ten times as much land, had five times as many beautiful structures, and hosted several large ponds, some humongous waterfalls, and several bridges (Heidelberg had none of these). The Schloss (palace) was not hard to find. 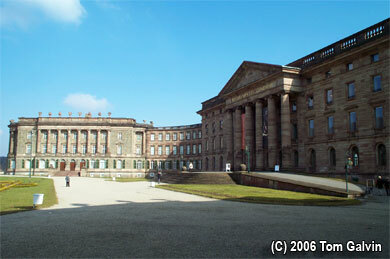 Kassel's main street, the Wilhelmshöher Allee, ran east-west from downtown Kassel to the base of the complex. When I left the Kassel-Wilhelmshöhe train station, all I had to do was look left, and up in the middle of the hill was the Schloss, with its famous Octagon and Herkules high above it at the very top. They were clearly massive structures and the hill looked pretty big, but I was brave and masochist and decided to walk it. Little did I realize just how big that hill was. The Bergpark covered 240 hectares, most of it on a sharp incline -- climbing steadily three hundred meters (350 yards) in altitude within only 1600 meters (1 mile). For math whizzes, that came to an average of eleven degrees climb. For non-math whizzes, that was a pretty friggin' steep hill. 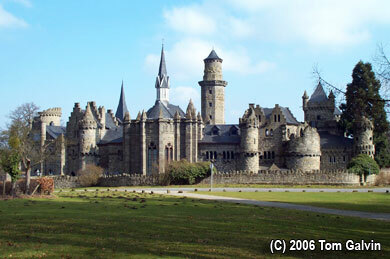 The first stop on the climb was the Schloss itself, and its surrounding buildings. Now serving as a museum (which I did not visit), the Schloss looked like a brand new federal courthouse with its massive columns and ivory-tower appearance. From the front, it glowered at me from atop a grassy plateau. But the back facade(first photo) facing the park seemed less imposing. Though it was March, and therefore its garden was not yet growing, I could tell that it was very colorful in the summertime. Despite the cold day, the castle's pond, shown in the second photo with the white Apollo Temple, took plenty of visitors. Most of the park's usable structures were nearby -- including the pink Ballhaus, an orangerie, an open-air music conversatory, and a café. Information from the Ballhaus and conservatory included a regular slate of events during the summer. But the Bergpark's major draws were further up the hill: its dazzling array of artificial ponds, canals, cascades, and waterfalls. The park's brochure advertised a daily guided tour in the summer where visitors would be taken to the park's major falls. As these were turned off in the winter, only natural water flows were available when I visited. These were still very, very beautiful. Especially when matched with some of the Bergpark's artificial ruins, like the Roman Aquaduct in the third photo (which is also visible in the second photo background). Located a few hundred meters behind the Apollo Temple, this Aquaduct stood above a series of artificial cascades running along a straight canal. I took that shot from a walking bridge over the canal directly below the aquaduct. Without the full force of the water running, the cascade sadly looked like nothing more than a bunch of rocks. That was apparently the motif of several of the cascades -- pile a bunch of rocks and have the water flow over it at a heavy rate. Such would explain the rather bizarre artificial fall midway up the hill called the Steinhoefer. The Steinhoefer was a hundred-meter tall pile of small moss-covered boulders pressed against the side of a cliff. How it looked in the summer with the full flow of water I had to leave to my imagination. The Bergpark had several ponds and reservoirs dotted about all the way up. The Teufelsbruecke (Devil's Bridge) was a beautiful arched bridge with a rocky cascade underneath, dumping into the Pluto Grotte, another artificial pond. For me, the grand prize of the day was the climb up to the very top of the mountain and reach the Octagon and its statue of Herkules (Hercules, the light blue figure) on top. These are shown in the fourth photo. Getting there was quite a chore, as the closer I got, the steeper the hill became. Thankfully, the path was converted to steps... I lost count after six hundred, though. The dark gray structure leading up to it was another artificial cascade, a really, really huge one that was still completely dry when I went. When running, that cascade was the Bergpark's primary draw. However, most people didn't get there the way I did -- there was a massive parking lot behind the Octagon, at the end of a highway that snaked around the back. Also, the city's bus system made regular runs there in the summertime. I climbed back down, but a different way, because there was one more structure I needed to visit, located off the direct path from the Castle to the Octagon. The Loewenburg Castle ruins are shown in the fifth and final photo, another set of artificial ruins that from the Schloss look like they emerged from the woodline. 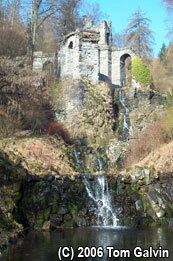 The brochure stated that these ruins resembled a Scottish castle, complete with tall towers and a small chapel. This castle was plenty big to house a small town and host a market in the middle! Nowadays it hosts a small medieval museum and an active vineyard. It was hard to describe them as ruins, as only the watchtowers appeared incomplete. The rest was quite habitable. So, was the climb worth it? Absolutely! I felt really tired by the time I returned to the bottom of the hill to continue my journey, but I was really refreshed after some first-class exercise. I was very happy to get a gloriously sunny day to enjoy the palace ground's wonderful sights. I decided that I really needed to return some time in the future in the summer so I could see what the cascades looked like when running full of water. Now, returning to the original thread... comparing this complex with Heidelberg Castle. The biggest advantages Heidelberg's Castle had were its proximity to the downtown and its accessibility by bus, train, or foot. 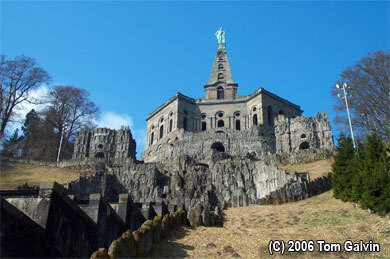 I could not say that about Wilhelmshöhe, it was way far away from the rest of Kassel's downtown. Those who were not mountain goats and did not have a car were relegated to the bus option. 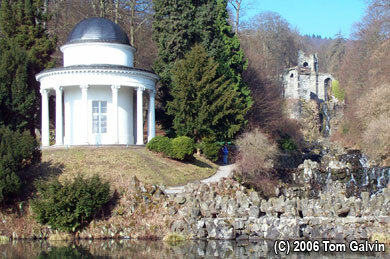 But otherwise, Wilhelmshöhe wins out as the more impressive.